(PhysOrg.com) -- ESA's XMM-Newton orbiting X-ray telescope has uncovered a celestial Rosetta stone: the first close-up of a white dwarf star, circling a companion star, that could explode into a particular kind of supernova in a few million years. These supernovae are used as beacons to measure cosmic distances and ultimately understand the expansion of our Universe. Astronomers have been on the trail of this mysterious object since 1997 when they discovered that something was giving off X-rays near the bright star HD 49798. Now, thanks to XMM-Newton’s superior sensitivity, the mysterious object has been tracked along its orbit. The observation has shown it to be a white dwarf, the dead heart of a star, shining X-rays into space. Sandro Mereghetti, INAF-IASF Milan, Italy, and collaborators also discovered that this is no ordinary white dwarf. They measured its mass and found it to be more than twice what they were expecting. Most white dwarfs pack 0.6 solar masses into an object the size of Earth. 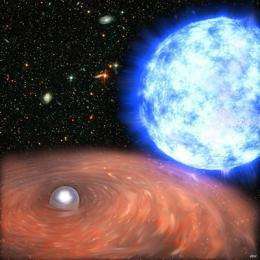 This particular white dwarf contains at least double that mass but has a diameter just half that of Earth. It also rotates once every 13 seconds, the fastest of any known white dwarf. The mass determination is reliable because the XMM-Newton tracking data allowed the astronomers to use the most robust method for ‘weighing’ a star, one that uses the gravitational physics devised by Isaac Newton in the 17th century. Most likely, the white dwarf has grown to its unusual mass by stealing gas from its companion star, a process known as accretion. At 1.3 solar masses, the white dwarf is now close to a dangerous limit. Our descendants are in for quite a show. Thanks to XMM-Newton, we can already start looking forward to it. More information: 'An ultra massive fast-spinning white dwarf in a peculiar binary system' by S Mereghetti, A Tiengo, P Esposito, N La Palombara, GL Israel, L. Stella will be published in Science on 4 September 2009. "Calculations suggest that it will blaze initially with the intensity of the full moon and be so bright that it will be seen in the daytime sky with the naked eye." But what do think will really happen??? What could be hiding inside this 1.2 solar mass white dwarf with a diameter just half that of Earth that allows it to rotate once every 13 seconds? That future is a spectacular one. The star is likely to explode in a few million years’ time. lol! oh yeah! i can't wait to see it! @omatumr - I would imagine that it's higher than usual solar mass likely has something to do with a super dense core, else it would have no chance at becoming a neutron star, as the article says is one of the two most likely outcomes. Though without being able to study it from a bit closer we may never know exactly what's going on in this little dwarf. A NEUTRON STAR HIDING INSIDE? We are a bit closer to the Sun. Are you absolutely certain that there isn't a neutron star hiding there? The ghosts of christmas past, perhaps? This new book, "Heaven and Earth: Global warming - the missing science" (Taylor Trade Tublishing, New York, 2009) by Professor Ian Plimer, Australia's best known geologist, confronts solar dogma with experimental data.